Every company, from a small online store to a multinational group, collects detailed data about daily events. The events range from purchase transactions, through the effect of marketing initiatives, to the company's social media activities. This huge volume of unstructured data – big data – promises to deliver valuable insights and abundant material for decision making. If you want to benefit from this information, you have to face the challenge of big data. Conventional big data solutions still lug around the legacy of an ecosystem built around a database – whether SQL or NoSQL. Astronomical licensing costs take them virtually out of the reach of medium-sized enterprises, especially if high-availability features are desired. The biggest bottleneck in these solutions is often the database, because it typically will only scale beyond the boundaries of individual servers with considerable administrative overhead. Conventional data analysis methods and relational databases can reach their limits. Even some cloud solutions do not scale without mandatory downtime. One possible way out of this dilemma is Hadoop . Apache Hadoop is a framework for distributed processing of, in particular, unstructured data on computer clusters. Hadoop makes it possible to run computational processes at low cost, whether on-premises on commodity hardware, at a data center, or in the virtualized environment of a cloud service provider. Access to an ordinary relational database relies on queries in one of the many dialects of SQL (Structured Query Language). If you need to access non-relational databases, other languages besides SQL are possible (hence the term NoSQL). Hadoop does not fall into these two categories, because it simply does not use a database; it is this distinction that lends Hadoop its flexibility and robustness. Hadoop consists of two basic components: the Hadoop Distributed File System (HDFS) and a distributed, modularized data processing framework: Hadoop uses MapReduce 1.x, whereas Hadoop 2.x relies on either MapReduce or its successor YARN  (discussed later). The role of HDFS is to provide the most efficient, fastest possible fail-safe storage of the data. HDFS is not a "clusterized" filesystem but a distributed one: It runs on multiple nodes in a network – but without an expensive SAN solution. HDFS is therefore very cost efficient. The data processing framework talks to the filesystem, which manages the resources and monitors the execution of the commands sent by a Hadoop-compatible application on the framework. These commands form jobs, and jobs are implemented as individual, tiny Java applications. Thanks to this architecture, workloads can be spread across multiple nodes of a computer cluster, and the cluster itself can be reconfigured even while performing jobs. This approach results in several important advantages. For example, Hadoop scores points with its ability to scale as needed, without downtime. This elasticity is useful not only if the amount of data sharply increases or decreases but also if deadlines make temporary provisioning of additional computational resources desirable. As the load on the active nodes increases, additional nodes can be started automatically, for example, using Amazon API AWS autoscaling. In this case, the cloud uses CloudWatch to monitor the load on the individual instances. Once the conditions set by the administrator are met, AWS automatically launches new server instances that are integrated into the Hadoop cluster, registered with the resource manager, and then finally able to take on jobs. Hadoop also works in a very resource-friendly way; instead of copying large amounts of data back and forth across the network between different nodes, as is the case with many RDBMSs, it sends comparatively small instructions exactly to where the required data already exists. In a database running on multiple servers, the data typically is stored separately from the software logic and on different instances. In contrast, in a Hadoop cluster, both data and the data processing logic exist on each machine. This setup means that the framework can run individual jobs very efficiently: on the instance holding the required data in each case. The redundancy resulting from distributed data processing also improves the robustness of the cluster. A variety of free and commercial tools exist to enhance Hadoop with additional capabilities. For example, with the Apache Hive open source application, you can convert SQL queries into MapReduce jobs and address Hadoop as a (distributed!) SQL database. If you follow developments in the US IT job market as a benchmark for future trends, you will find that the need for Hadoop skills is skyrocketing (Figure 1). This is little wonder, because the framework has many practical applications. 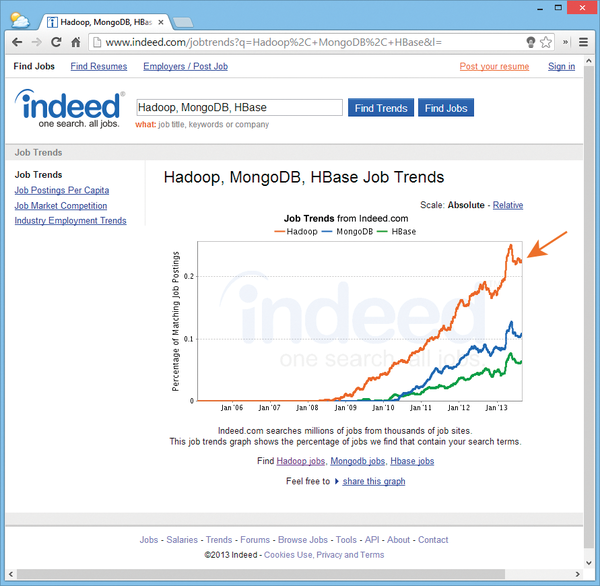 In Germany, too, job offers relating to big data with Hadoop are on the increase. For example, recruiter Hays AG is looking for Java developers, software architects, and system administrators with Apache Hadoop skills for different locations throughout Germany. JobLeads GmbH tried to recruit nearly a hundred Hadoop-savvy IT professionals in the same period on behalf of unspecified customers. Figure 1: Trends on the US labor market promise Hadoop-savvy IT professionals a bright future. According to a study by IDC, the worldwide market for Hadoop has an annual growth rate of 60 percent. However, the same study also stated that this rate of growth is limited almost exclusively to the use of Hadoop as elastic and cheap distributed mass storage. Although Hadoop is a world leader in the field of data analysis, it is precisely this functionality that often seems to lie fallow in practical applications. Hadoop users with lower development capacities understandably tend keep their growing datasets on the low-cost HDFS and use external, but less powerful solutions to handle data analysis. The reason for this is obvious: MapReduce in Hadoop 1.x is perceived by many as too complicated and not sufficiently flexible. Hadoop 2.x seeks to remedy the situation and help achieve wider dissemination of the powerful big data framework. Hadoop version 2 expands Hadoop beyond MapReduce and opens the door to MPI applications operating on large parallel data stores. Apache Hadoop is currently the marketing favorite for Big Data; however, setting up a complete Hadoop environment is not easy. OpenStack Sahara, on the other hand, promises Hadoop at the push of a button.